This social networking site is powered by Dolphin Community Software from BoonEx. 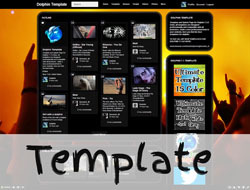 Template and Splash Page for Dolphin 7.1.0 Osho, all templates are designed professionally and compatible with all browsers.. make a new professional look to your website, here you find the best templates for dolphin.. Subscribe now for Dolphin Template newsletter to receive news, updates, photos of top rated members, feedback and tips to your e-mail.